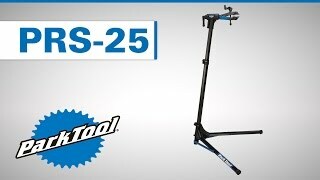 The Park Tool Aluminium Team Issue Repair Stand is one of the finest folding stands available and is lightweight, stable and packed with features. The 100-25D Professional Micro Adjust Clamp quickly clamps and releases nearly any tube from 7/8 inches to 3 inches (23-76 mm), including aero tubes and offers fully adjustable clamping pressure. The narrow clamping jaws (2.7 inches/7 cm) fit into tight areas or on short seat posts and there is also 360-degree clamp rotation. There are soft but durable composite rubber clamping pads, and a saddle cradle provides a perfect spot to temporarily rest a bike by its saddle. The three-point leg system creates a stable base on smooth or rough surfaces and it easily folds to 47 inches. The clamping height adjusts up to 60 inches and the proprietary Hexatude hex-shaped aluminium tubing ensures low flex and no rotation. Aluminium leg straps ensure all parts slide, fold and unfold together. The stand weighs just 13 pounds/6kg.